Challah is a braided Jewish bread eaten on Sabbath and Jewish holidays. There are different braid patterns depending on number of strands used in braiding the bread. Because of Jewish dietary restriction, Challah is usually parve (containing neither dairy nor meat, important in the laws of Kashrut). Also, Challah for Jewish New Year is coiled instead of braided, sometimes referred as ‘Turban Challah’. How did my first challah turn out? The look was… weird, actually kinda ugly. I think I braided my challah too tight, didn’t giving each strand space to breath and expand to form the nice round curves. Also, the oven temperature was too high. I had to trim off the burnt bottom of the bread. The crumbs? It’s soft, but not as soft as I would like. Oh well, at least the family didn’t mind and finished the loaf. I sure had fun braiding the bread though. Add water to the bottom of bread maker loaf pan. Then sprinkle in flour ensuring covering all the liquid. Make an indent in the middle and add in yeast. Add sugar and salt in separate corners. Select “Dough” course and press “Start”. Check the dough when it is kneading: scrap down any dry flour, add 1 tbsp water if it’s too dry. When the dough course completes, unplug the cord and let it sit inside the loaf pan for 8-10 hours. Do not open the lid. The sponge will eventually collapse and look bubbly and sticky after 8-10 hours. Add all other dough ingredients to the sponge in the loaf pan. Select “Dough” course and press “Start”. When the course completes, remove dough from loaf pan and place in a large bowl. Cover the bowl and rest in a warm place until the dough is almost double in size. Transfer dough to a lightly floured work surface. Knead gently to push out the air, then divide into 6 portions. Roll each portion to a 16-inch thin log and start braiding. 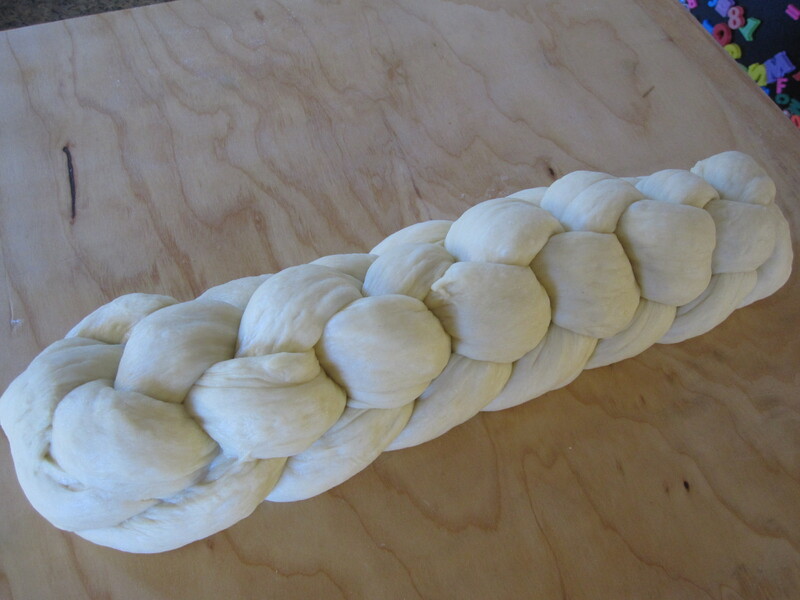 Please check out this wonderful 3-4-5-6-7-8-9 strand braiding video from The Bread Kitchen. 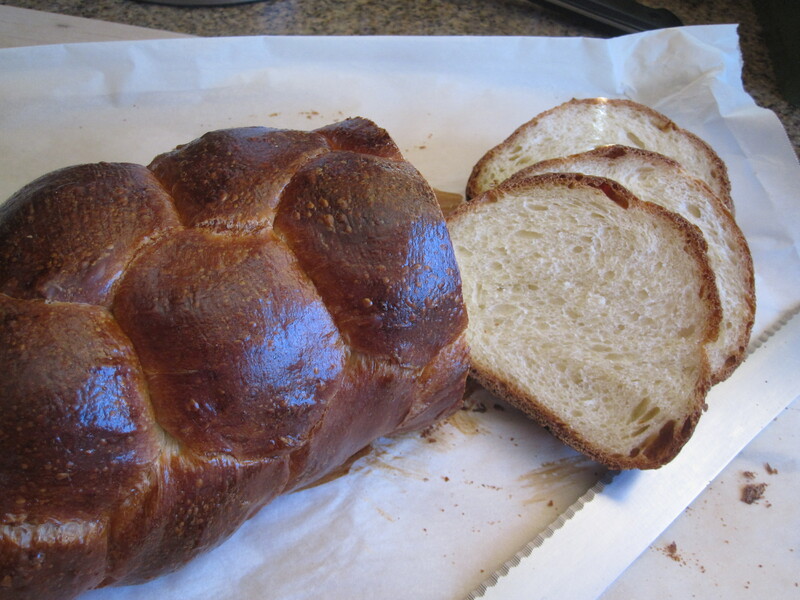 Place braided challah on a baking pan lined with parchment. Loosely cover the bread and place in a warm place until it almost double in size. Apply egg wash and bake in preheated 375°F oven for 40 minutes (if the top browns too quickly, tent the top with a piece of aluminum foil after 30 minutes). Remove from oven and cool completely on a rack. Braiding the bread: I braided my challah too tight, so the pattern was not as obvious and kinda ugly. Next time I will braid a little loose so the curves will pop up after baking. Oven temperature: I find 40 minutes/375°F is too high and too long for my challah. the top is very brown and the bottom is burnt ( I had to slice off the burnt bottom). So maybe 40 minutes/350°F on next trial will work out better?